Safety should always come first when climbing and a high-quality single rope should always be included in your climbing equipment. When your life is literally hanging by a thread, that thread needs to be of the highest quality and tough single ropes guarantee a high level of safety when it comes to climbing! Single ropes are between nine and eleven millimeters thick and typically weigh 55-85 grams per meter. Single ropes are mainly used in the climbing gym and climbing parks and are always used in a single strand. What requirements do single ropes have to fulfill? Single ropes cannot break in case of a fall, so they have to fulfill some special requirements. 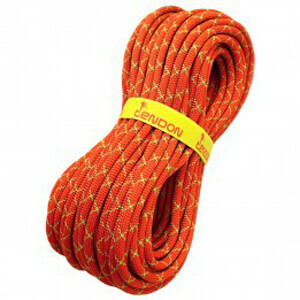 Single ropes are tested according to the European safety standard EN 892 before they can go on sale as climbing ropes. According to this standard, a single rope has to withstand five UIAA falls with a weight of 80 kg without breaking. In addition, the rope may stretch no more than 10 percent under load and 40 percent in the case of a fall. If these conditions are fulfilled, the model is approved as a climbing rope. What should I look out for when buying a single rope? Single ropes can be used for any number of things. So the properties of the rope should always be selected according to the area of use, personal preferences and individual climbing skills. However, all single ropes should have a few basic properties. First and foremost, a single rope should have a high breaking strength to provide you with optimum protection in case of a fall. The rule of thumb is, the thicker the rope, the higher the breaking strength. Having said that, thinner single ropes have enormous breaking strength nowadays, thanks to modern manufacturing processes and special fibers. High-quality single ropes should also be easy to handle. They should run smoothly through the belay device and they should not tangle easily. If you climb outdoors, in climbing parks for example, it is worth considering a single rope with waterproofing or a special coating. This helps prevent the rope from absorbing dirt and moisture and significantly increases service life. If you discover strong signs of wear or damage to the rope, it should be replaced immediately.